All or nothing, completely go for it. Georgette dots the i’s and crosses the t’s, she loves working hard for a beautiful outcome. Making something beautiful, either in a big band, a combo or on a theater stage. She touches her audience and takes them with her on a musical journey. In her own one-woman-show, big band, salsa, jazz, pop band, wood section, solo with DJ, tango, a musical theater production or Brazilian music. 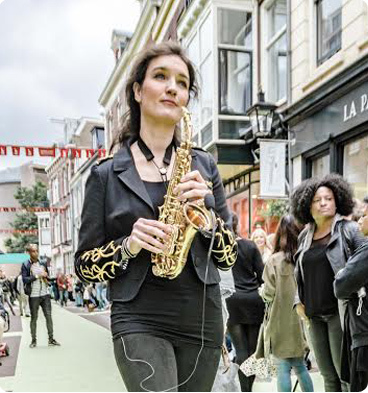 In Wolter Kroes’ band she combined playing the saxophone with backing vocals. At this moment she is part of the Chronometer’s Orchestra, the group founded by the talented young composer Zacharias Falkenberg. Pop & Jazz saxophone at the ArtEZ Conservatory in Arnhem. Georgette plays all saxophones (mostly alto- en soprano-), flute and piano.